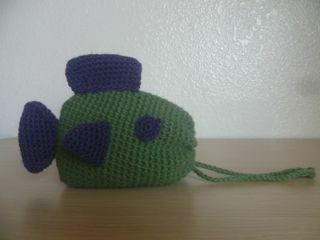 My brother’s camera case finally fell apart so I made him a fishy one to replace it. You will need a 3.5 mm hook and 8 or 10 ply wool. This pattern is written in American crochet notation. The case is big enough to fit a fairly big point and shoot camera. Fasten off, sew in end. 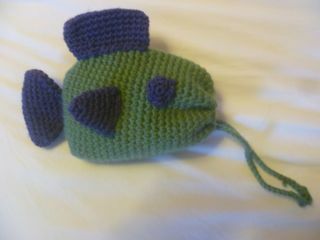 Sew on the eyes, side fins, tail fin and top fin. 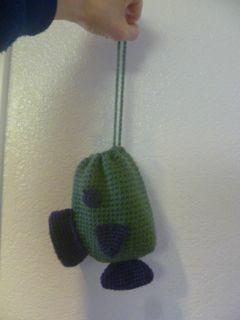 Hold the drawstring on the inside edge of the opening of the body of the case. Sew a series of loops over it to hold it firmly against the inside edge (but not so firmly that it can’t move when you open and close the case. (I sewed a loop for ever stitch along the edge). Tie the ends of the drawstring together to form a loop and sew in the ends to neaten it up.